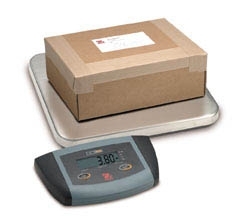 Ohaus ES series digital bench scale have a large platform with stability indicator, auto zero tracking and auto shut off. Simple, easy to use 2 button operation. Indicator can be wall mounted. Capacity x readability: 13.2 lb x 0.005 lb. 12.2 x 10.8 base.